Hello and welcome to Webcomic Wednesday! Each week I take a look at a webcomic and let you know what I think about it. This week I’m having a look at a comic that takes you behind the curtain to see how the artist works in a digital space. 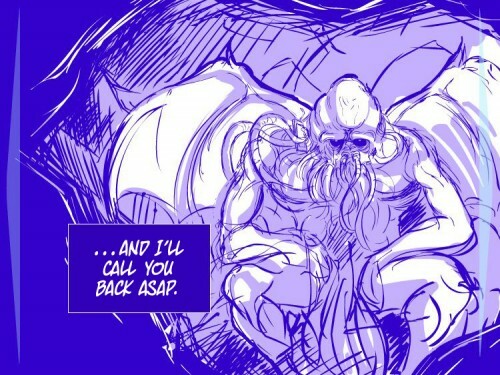 It’s Cthulhu Calls, courtesy of Mark Waid and Yves “Balak” Bigerel. While Mark Waid’s name may be tied to this particular comic, he isn’t the star of this show. What began as a short script for a print comic, Waid asked artist Yves “Balak” Bigerel to begin a simple storyboard for a digital comic, which he then turned into its own peek into the artist’s mind. Balak provided not only the storyboards, but also annotations below each, explaining the process each step of the way. I’m not sure about any of you but I find this both informative and incredibly interesting. Each step is meticulously thought about in such a way to enhance the visual aspect of the storytelling – it brings up points I didn’t necessarily consciously notice, but felt them anyway. Balak’s annotations are fantastic and it’s clear how important good art is to this medium. That’s not to say the story is any less good – the brilliant tale of Cthulhu unable to take a one night stand is funny and original, and it’s full of personality. I’d actually like to see more stories like this from Waid, as it is just so much fun. If you wanna see what goes on behind the scenes of making a comic you can check out Cthulhu Calls here. It’s funny, original and incredibly informative.